A couple quick complaints about how corporate presentations are expected to go. Most companies feel that everyone should have the presentation materials an hour plus before the meeting so they can review. Most executives has the PowerPoint printed so they can scan ahead of the presentation. Usually, reading ahead means questions come up prior to being at the point of discussion or the parties loose interest. We like to lock down our presentation because our presentations aren’t just a list of bullets and numbers. We have to build a feeling or the knowledge of our audience so we can not have them reading ahead. The room moves forward together, as a team, they reach a common conclusion. Our method is based on what we are trying to get out of a meeting. Generally it is to explain a new path or technology. 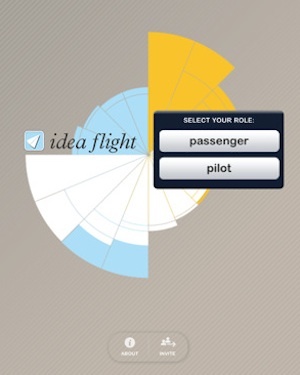 If you have a similar need, you might be interested to know about an app we just discovered, Idea Flight by Condé Nast. The concept is simple. Your iPad pushes out to as many as 15 other iPads your presentation in real time. You can allow your ‘passengers’ to read ahead or you can keep it locked for them to travel together. There is no need for an overhead, wires, remotes, etc… it’s your iPad presenting over Wifi (up to 15 viewers) or Bluetooth (up to 5 viewers) to others in the room. Of course, it means that everyone (or at least every other person can share) in the room must have an iPad. The viewing software is free to download and use (viewing is refered to as ‘passengers’. Anyone can pay via in-app purchase (currently $7.99) to be a Pilot and present to other iPads. This doesn’t mean a Pilot viewing your presentation can take over the presentation. The Idea Flight ‘Pilot’ presentations need to be a PDF file, which means you will need to convert your PowerPoints, images, etc to PDF. Simple enough on a Mac, just ‘print to PDF’. Move that PDF or group of PDFs to your iPad via iTunes sync, email or DropBox and your ready to run the show. To start, send out an invite that encourages people to download Idea Flight prior to the event. When they arrive, they can join into the presentation. 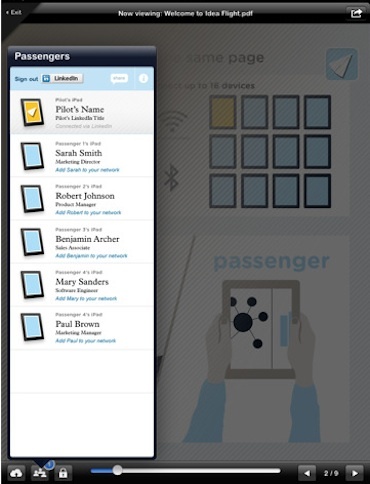 Idea Flight has the option for people to see who is viewing and additional information about each person. The ‘additional information’ is data pulled from their LinkedIn account. The Pilot uses Idea Flight to push out the presentation in real time, so everyone is locked to the same view. If the presenter chooses to allow everyone to freely view through the presentation, there is an option on their screen to ‘unlock’ or distribute the presentation for later reading. A handy tool for Teachers for a class to read together than review on their own later. We were all pretty excited about this concept and are going to start pushing it as a viewing option at our presentation to see how many people jump on board with their iPads and how many still want to kill a tree, er… show up at the meeting with a pre-printed copy. If your not sure you have an audience for Idea Flight, grab a free copy and play with included presentation to see if it fits your needs. We’ll report back on our success/failure rates here over the next couple weeks.